New Year’s Eve is a special opportunity to reflect on everything that’s happened over the last twelve months, and to look forward to the coming year. For a thoroughly revolutionary New Year’s Eve celebration, consider the calm and serenity offered by our Morocco desert tours. A world away from crowded fireworks festivals and parties into the early hours, our magical New Years Eve packages offer an unrivalled opportunity to revel in the star-studded splendour of the Sahara Desert. In this most spiritual of places, you will be free to meditate on your recent past and future hopes and wishes, as you enjoy a dazzling light show provided by nature herself. We all make resolutions at this time of year, but many are conjured up in the haste of a New Year’s Eve party, and, sadly, soon forgotten. These promises to ourselves are vitally important, as they propel us forward on the developmental path to enlightenment and enrichment. In the clear and refreshing light of a Sahara New Year’s Day, you will be inspired by the majestic surroundings and towering, ageless dunes, to keep your resolutions and keep moving forward. At Desert Majesty, we have created wonderful Morocco desert tours just for New Year’s Eve. Whether you are travelling as a couple, a group of friends or a family, celebrating New Year’s Eve with us will be an awe-inspiring, once-in-a-lifetime experience. 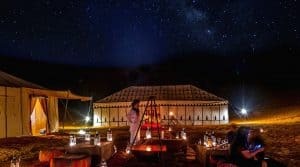 Our packages include authentic, charming accomodation in a traditional desert tent, complete with toilet and shower facilities, mattresses, sheets and plenty of blankets – perfect for snuggling up in under the stars. We recommend that you bring along a small towel, a torch, and a pack of biodegradable wipes, for your comfort.You will need a sunhat for the scorching desert days, and warm clothes for the chilly Sahara nights, as well as thick socks and trainers for treks among the dunes. Your magical Moroccan New Year’s Eve gathering begins with a warm greeting in our shimmering desert oasis. You’ll be provided with traditional Moroccan green tea, perfumed with mint, and offered delicious biscuits and dates to perk you up for the party ahead. We provide full catering for our New Year’s Eve Morocco desert tours, including a four-course dinner of soup, salad, tajine or couscous (a vegetarian option is available) and dessert. Does the thought of a star-studded sky above you, a camp-fire and the drumming of nomad music instead of fire-works in the street appeal to you as an alternative beginning to a New Year? The silence and majesty of the Sahara is a spiritual place to weave resolutions to carry through into 2019, promising yourself to make dreams come true. At the bivouac, each couple/family has their own tent, which is equipped with mattresses, clean sheets and plenty of blankets. But why not treat yourself and upgrade to a luxury bivouac in these unique surroundings and allow yourself to be spoiled for the start of a New Year? On arrival you will be greeted with Moroccan green tea perfumed with mint, offered with biscuits and dates.